The connection between food and art has always been so obvious to me — in many ways, food is art, even if you aren’t a chef in a Michelin starred restaurant! Misshapen tomatoes at farmer’s markets are art. Greasy pizza at 2 AM is art. Food is poetry just as much as any Mary Oliver poem. 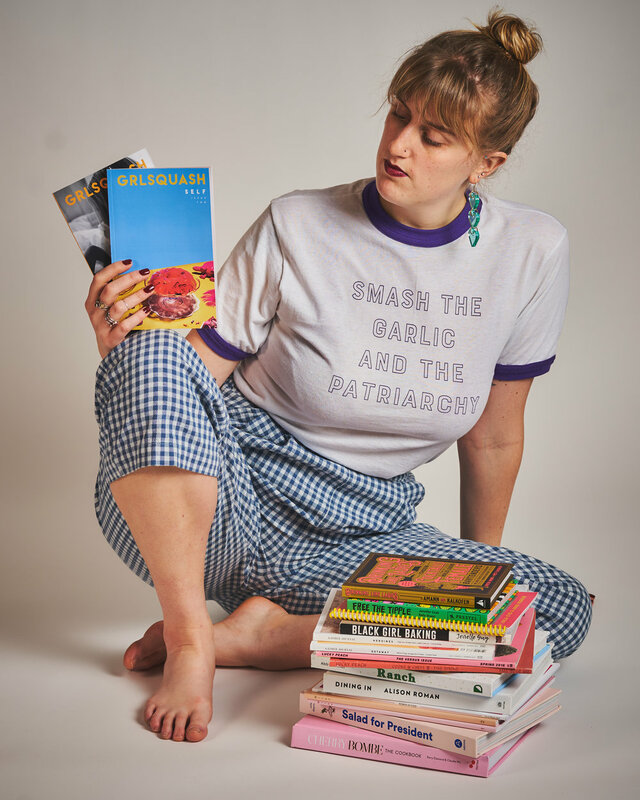 I work as a freelance food writer and the Founder + Managing Editor of GRLSQUASH, a womxn’s food, culture, and art publication. Past food world involvement includes: serving, bartending, event management, catering, being the daughter of a caterer, and surely more I’m forgetting. This is a world I was born into and one I feel very comfortable + happy in! Why is it important for women and women-identifying people to have niche communities like GRLSQUASH? Womxn and womxn-identyfying folks will never have enough spaces dedicated to them. It’s important for womxn-centric spaces of all kinds to exist, whether it’s womxn-owned wine bars like Rebel Rebel in Somerville’s Bow Market, any of The Wing locations (Boston coming soon!!! ), or figurative spaces like the one we occupy in the publishing world. It’s important for these spaces to exist because the rest of the Western world is so male-focused. The Western world was built by and for the straight, white patriarchy and in order to break out of this, I believe creating spaces built by and for womxn is a step towards flipping the narrative. At the core of each GRLSQUASH issue is food, but there's also a deep emphasis on art. Why did you choose to construct GRLSQUASH this way and how is art a medium for expressing ideas about food to you? GRLSQUASH was inspired by other food-art journals like Gather and Lucky Peach, before it met an untimely end. The connection between food and art has always been so obvious to me — in many ways, food is art, even if you aren’t a chef in a Michelin starred restaurant! Misshapen tomatoes at farmer’s markets are art. Greasy pizza at 2 AM is art. Food is poetry just as much as any Mary Oliver poem. I think including so much art, especially visual art, makes the more difficult topics easier to digest (pun intended). The visuals are eye-catching and can speak novels without the viewer having to read a single word. Then, when they do read the accompanying words, it’s like the blow has been softened as they read a personal account of one womxn’s eating disorder, as in Issue Two: SELF. I’m not sure if this makes sense to anyone other than me… BUT I know that I’m not the only one who gets that food + art + womxn = YES. I resist the patriarchy by buying from womxn whenever possible. I resist the patriarchy by running a feminist publication. I resist the patriarchy by teaching the three sisters I nanny that they can be whatever they want when they grow up. I resist the patriarchy by empowering the womxn around me. As a new publication, there is so much on the horizon and so much room for growth. How has GRLSQUASH evolved since it's inception and in what areas do you hope to grow the most in your second year as a publication? GRLSQUASH has grown beyond anything I ever expected. I mean, obviously I would love to reach a Conde Nast level of success (and we certainly haven’t reached that yet), but I still had no idea people would get behind this project with such gusto. Since launching our first issue in August 2018, we’ve double our original list of stockists, put out a second issue 50% longer than the first (that’s 40 pages more! ), almost doubled our contributor list from Issue One to Issue Two, raised over $500 for local non-profit organizations, and more. I think the biggest area I’d like to grow — in addition to continuing to expand our stockist list and geographic reach — is profit. I want to get to a place where the publication can sustain itself and we can pay contributors for submissions. Then, I’d like to pay myself and my co-founder and make GRLSQUASH a full-time job. I’m not sure how all of this is possible, but seeing how much we’ve grown in less than a year, I’m hopefully we can make it happen!